Abram Atkins, Nicholas Britiffe Skottowe, Robert Roberts. 30 Shillings 1 Oct 1809. 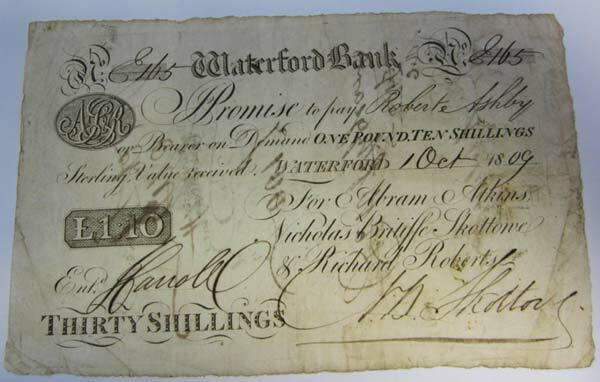 Here is a £1 note from this partnership dated 1st December 1808 and signed by N.B.Skottowe. Last edited by DOC on 09 Aug 2018 22:07, edited 1 time in total. Here is a 1 Guinea note from Atkins & Co. dated 2nd May 1808. Last edited by DOC on 09 Aug 2018 22:10, edited 1 time in total. 5 Guineas, date looks like 3 May 1808. Here is a 1 & Half Guinea note from this partnership dated 1808. Here is a £3 note from this partnership dated 1st June 1808. This is the earliest date I have seen on a £3 note from any Irish Bank. If anyone has an earlier example it would be interesting to hear about it. Here is a 2 Guinea note issued by this bank in 1809.